Don't let this spring celebration creep up on you! The main event is only two weeks away so now is a good time to think of what you'll give your mother to tell her you love her. 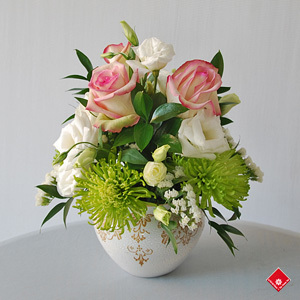 Mother's day is a great time of the year for you and mom so The Flower Pot's designers have created a special floral arrangement that represents your unique bond. A beautiful decorative white ceramic pot is filled with creamy Cézanne roses, bright green italian ruscus, and Shamrock fuijis for a modern flavour. If flowers seem too cliché to you, what better Mother's day present than hand-made chocolate? A box of chocolates from Chocolats Privilège will certainly satisfy her sweet tooth. Looking for something more personal? Visit our website, call us at 514-938-1234, or stop by our Griffintown shop (1340 Notre-Dame Ouest) to browse our other gift options and place your order.